The European elder plant is native to Europe, Northern Africa, and Western-and Central Asia. Elder flowers and elderberries have been used for a long time in traditional European medicine. Elderberries are also used to make preserves, cordials, and wines. They also have antioxidant properties, boost the immune system, lower cholesterol,and fight coughs, colds, flu, bacterial and viral infections. The US Department of Agriculture has an excellent Plant Fact Sheet on elderberries and includes photos of some plants. There’s information about different ways to use elderberries in cooking as well as details about growing elderberries. You can see the Elderberry Fact Sheet Here. I also found this wonderful article by JES. She explains how to infuse honey with dried elderberries. This results in a wonderful, immune-boosting honey that you can put on oatmeal, in tea, on toast etc etc. If you don’t have elderberries, she provides a source where you can buy them. It’s a simple recipe with great directions and photographs. 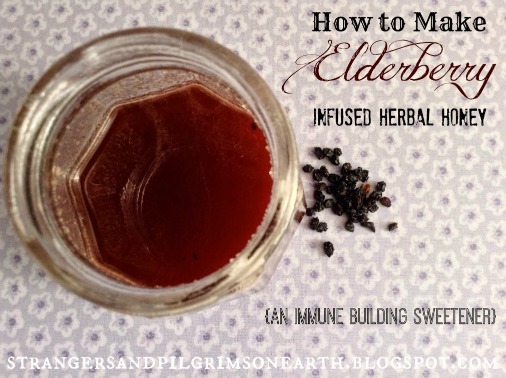 Click on the How to Make Elderberry Infused Honey ~ an Immune Boosting Sweetener link below to see the recipe.